As a child I was not a fan of meatloaf. We had it for dinner one night when I was around 6 years old and after taking a bite, I promptly declared to my mom that I “will never eat that again!” Clearly, I wasn’t only a picky child but a dramatic one at that. I just couldn’t figure out why anyone in their right mind would form ground beef into a loaf shape, slather it with ketchup and bake it. To be completely honest, I still don’t understand. I have a lot of word association issues that leads to my pickiness. A loaf is reserved for bread. Nothing else should come in a loaf form, especially meat. It’s just not okay. Scrapple is another issue. It has the word ‘scrap’ in it. How do people eat this stuff? I don’t understand. And for as much as I love fruit, it took me years to eat fruit salad because I associate salad with lettuce and the thought of lettuce and fruit together is just nauseating to me. And there is your insight into the strangeness that is the Cookaholic Wife. The first time I ever debated on trying meatloaf again was last year while watching an episode of The Next Food Network Star. Mary Beth made a meatloaf for some challenge and actually convinced me through the screen that it was worth trying. However, Food Network never published her recipe on their website so I gave up my interest in ever trying meatloaf again. Then Cooking Light provided me with a recipe for a cheesy meatloaf in a mini form. The ketchup on top was still pretty unappealing, but it looked okay enough that I figured it was worth a shot to try it again. 1. Spray a large skillet with non-stick cooking spray. Heat over medium and add the onions and garlic. Cook for 3-5 minutes or until soft. 2. Preheat the oven to 425. Line a baking sheet with foil. Place a wire rack on top of the baking sheet and spray liberally with cooking spray. Set aside. 3. In a large bowl, add all of the ingredients and mix until well combined. 4. Form into 6 loaves, about 4×2 each. Spread the remaining ketchup on top of the loaves. 5. Place the loaves on the prepared rack and bake for 25-30 minutes or until cooked through. Honestly, I was just “meh” about the meat loaf. It was edible but when I read the name “cheesy meat loaf minis” I expect there to be a significant amount of cheese. I would like to make these again and try stuffing them with cubes of cheddar or even a pepperjack cheese. 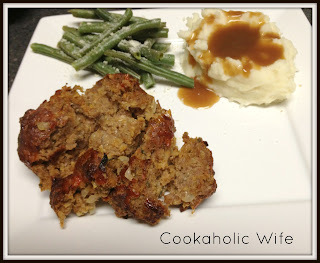 I don't know what I would do if my kids turned their noses up at meatloaf, it is in the regular menu line-up for the week and we have every week.